Last weekend I wrote up my ode to the Widmer Gasthaus, not knowing that more news was on the way from John and Jeff about Widmer's brewery expansion and next winter's seasonal. It also came out that Widmer took two golds in the World Beer Cup, for their Hefeweizen and for their Pale Ale -- is that the W'07? Then there was Widmer meet-the-brewer at the Green Dragon on Tuesday, but before I could turn that experience into blogging gold, the Widmer brothers popped up again, announcing that they'll help promote the start of National Bike Month May 1 by racing one another across Portland, Kurt in a car and Rob on a bike. I guess this is just Widmer Week. The meet-the-brewer was interesting as always. 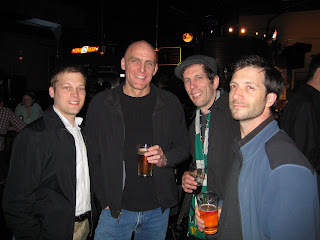 Here's a picture of one of the Widmer brewers, Doug Rehberg (second from left). To his left is Kerry Finsand, a Portland beer writer who's developing the Portland Beer Wiki; on the right are my buddies Corey -- himself a recent meet-the-brewer brewer -- and Matias. Doug told us he's been with the company for fourteen years -- that's job satisfaction for you. Judging from the color of the beers, I think Doug has Widmer's Belgian Golden, Corey has the KGB Russian Imperial Stout, and Matias has an Old Embalmer Barleywine. It wasn't the barrel-aged KGB that they sometimes have, but it stood on its own and really didn't need the bells and whistles. It was a delicious chewy stout. The Embalmer was fantastic also, not the wildest barleywine at 9.5%, but it had the classic American hoppy barleywine flavor. A fourth keg was on tap also, the Broken Halo IPA. I wish they'd brought a keg of Hefeweizen so that people like me could stop boasting that the Green Dragon had never served it. Since Lee had asked whether Broken Halo was endangered by the hop shortage, I went ahead and posed that question to Doug. The answer was pretty much what I expected -- they keep everything lined up ahead of time and they're not sweating it. Doug had another tidbit of information for us -- the promotion of the W'06 NW Red to winter seasonal means that Snow Plow won't be bottled this year. It's logical enough, but sometimes you have to hit me over the head with these things. Every now and then I was in just the right mood to enjoy a Snow Plow, but I like the Red better. If you can't wait for winter, the NW Red is on tap at the Gasthaus right now -- so is the Old Embalmer, by the way. Side note: the Green Dragon never fails to amuse. There was no way I was leaving without trying Fort George's Oatmeal Pale Ale. It was drinkable, kind of tangy with quite a bit of hops on top. They probably aren't going to add OPA to the beer-judging categories, but I'm glad to see brewers push the boundaries like that. The Bikiest Brewpub in Portland?